I never cared about being the best rapper/sax player. I just wanted to tell my story and help folks that are going thru things. 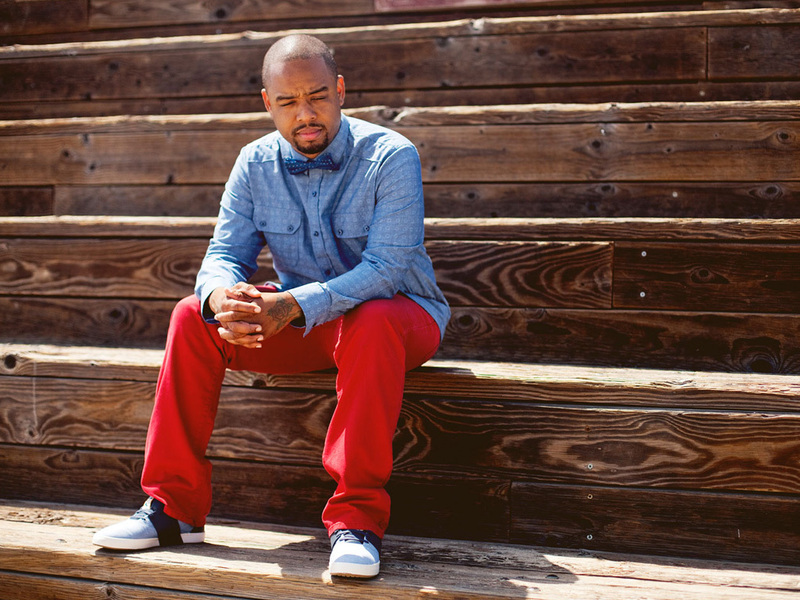 Terrace Martin is a notable musician, rapper and producer from the city of Los Angeles and from the beginning of his career he has lent his skills to artists such as Quincy Jones, Snoop Dogg, 9th Wonder, Talib Kweli and many, many others. Shattering the acknowledged rules of hip-hop production, he samples everything from funk to jazz to classical to create fresh and original tracks. His productions have made him one of the most sought after up and coming producers on the streets of Los Angeles. His father was a jazz musician, while his mother, was a gospel singer, destining him for a life in music. “I grew up in the middle with only hip-hop,” Martin says. “My parents taught me that there’s only good and bad music.” He began playing the piano at the age of six and at age 13, a friend encouraged Terrace to learn to play the saxophone and he did, finding one for $150 and learning to play it by himself. His Godfather Stemz Hunter, also a saxophonist, suggested Terrace enroll at Santa Monica High School to sharpen his musical chops. He walked in not knowing what a scale was and soon found himself practicing up to seven hours a day. Martin made a decision to transfer to Locke High, one of the LAUSD schools where the artistically inclined gravitated to with a tough reputation within an earshot of gang-ridden Watts. While attending Locke High, under the auspice of Reggie Andrews, Martin became first chair of the All-State jazz band. As a child prodigy, Martin gained the interest of talk show host Jay Len who provided a $30,000 scholarship and purchased Martin’s first professional saxophone. Fresh out of high school, Martin attended Cal Arts but decided school was not for him and opted, instead, to go professional. Martin was not only recognized by Hollywood elite, he also found favor in the jazz world where world-renowned jazz musician, Billy Higgins, made Martin a member of his World Stage All-Stars playing in the historic Leimert Park. From World Stage, Martin began touring with Puff Daddy and God's Property, presented by Kirk Franklin. “I didn’t believe in suffering to play, like why do musicians gotta suffer to play? Eating Top Ramen isn’t cool. I wanted to be main stream.” With that mentality guiding him, Terrace worked hard to get his beats placed for major artists albums. He scored a minor hit with 213’s “Joystick,” and went on to land beats on the Doggfather’s “Rhythm and Gangsta: The Masterpiece” and “Ego Trippin” albums Martin came from behind the board when he released his first project, The Demo and since has released a number of critically acclaimed masterpieces. Martin’s projects feature many guest appearances from the peers and mentors he has worked with who have lent their expertise to encourage the budding artist’s career. That means verses and production from the likes of Snoop Dogg, Wiz Khalifa, Pete Rock, DJ Quik, Kurupt, and plenty of others. In late 2010, Terrace Martin and MTV Hip Hop POV host and radio personality Devi Dev released the EP "Here, My Dear”, inspired by Marvin Gaye's critically acclaimed 1978 album of the same name. The EP has appearances from Snoop Dogg, Charlie Wilson, Kurupt, Problem, Kendrick Lamar and pianist Kenneth Crouch. In 2010, he executive-produced Kurupt’s “Streetlights” album and formed a group called Melrose with LA underground rap hero Murs that put out an album in early 2011. In 2012, Martin released a number of projects, and in 2013 he will grace the airwaves with his highly anticipated 3 Chord Fold, a fusion project that brings together some of music’s best, hitting fans with a vibe reminiscent of his 2009 release Hear, My Dear. While spending time with numerous luminaries in the studio, Terrace is one of the few artists in hip-hop who seamlessly works with underground, emerging and established artists; often on the same song. And it’s something he’s proud of. “To me, I just bridge the dope people with the dope people,” says Martin. His position in hip-hop music is unbridled, but it is his jazz musicianship that separates his sound from his peers. From jazz to hip-hop, Martin’s role models include Miles Davis, Charlie Parker, Jackie McLean, John Coltrane, Herbie Hancock, Sonny Stitt, Grover Washington, Jr., Dr. Dre, DJ Quik, Battlecat, Premier, Pete Rock, and 1580 K-Day. “I started producing hip-hop tracks because it was the music of my time, but I never lost my love for jazz,” Martin says. Terrace Martin is currently a staff producer for legendary Quincy Jones, Snoop Dogg, Wiz Khalifa, Top Dawg Entertainment (Kendrick Lamar) and also works closely with Dr. Dre.